Always ones to be first when it comes to new models, Vauxhall has unveiled its new oddly named Mokka - a compact SUV at the Geneva Motor Show. It will go on sale in the UK towards the end of 2012. 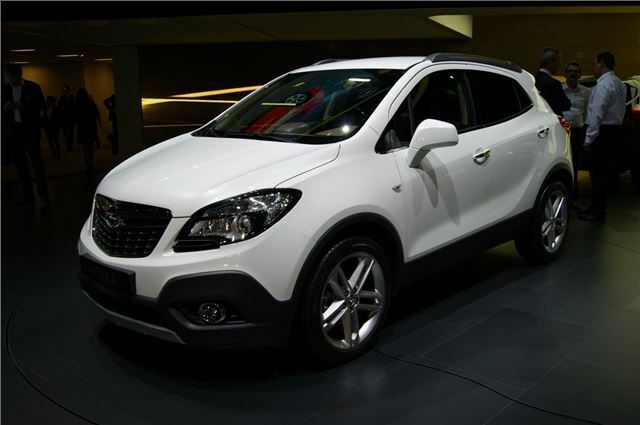 Vauxhall says the Mokka combines functionality with a high seating position and it's available with on demand all-wheel drive as well as a more efficient two-wheel drive version. At 4.28 metres long (that's around 14 feet) it's similar in size and stature to the very popular Skoda Yeti and the Mitsubishi ASX. It looks pretty good from the front but it's a shame the same can't be said of the rear. The line up includes three efficient engines - all of which sre fitted with a start-stop system. There is a 1.6-litre petrol or a 1.4-litre Turbo petrol. The one diesel is a 1.7 CDTi with 130PS and 300Nm of torque. The latter two engines are available with a six-speed automatic as an option. Most models come with 18-inch alloys as standard. Inside there are no fewer than 19 storage locations, apparently, along with a boot that can carry a maximum of 1372 litres of stuff with the seats folded down. It also has the latest generation of the integrated Flex-Fix bicycle carrier that slides out of the rear bumper and can carry up to three bikes at once. New features in the Mokka include a new generation Vauxhall front camera system which includes functions such as a lane departure warning system, Forward Collision Alert (FCA) and second generation Traffic Sign Recognition.